With coolers in back and rows of bottles up front—and perhaps, as on our visit, a staffer perched atop a pile of boxes, chowing down on his lunch—this liquor shop has a standard setup and a casual feel. 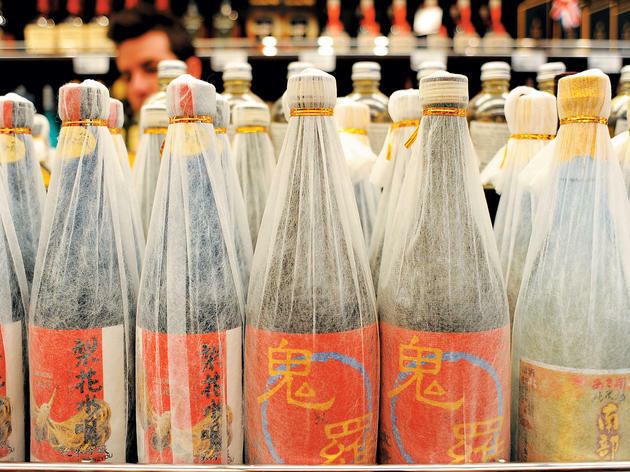 The store specializes, of course, in Asian liquors, and the wine selection is peppered with lychee liquor ($12.99), Chinese wine ($25.99) and sparkling pink sake ($6.99). Perhaps more hard-to-find still: Hello Kitty sparkling rose wine ($28.99). There are also goods that may be more familiar to the typical Chicago shopper, such as Grey Goose vodka and Opus One wines from California. If your looking for niche Japanese whiskeys or sochu, this is the place to go. 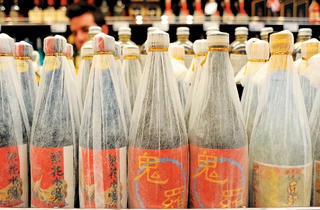 Shelves are lined with plenty of high brow and low brow selections, along with plenty of sake.